I noticed something at a Japanese Classic Car Show a few months ago. There seem to be a handful of Japanese cars from around the late 80s/early 90s which don’t have conventional nose badges, but instead have the manufacturer’s full name on the front of the car. The two cars I noticed at the show are the NA Mazda MX-5 and the FC RX-7 (pictured above). Both forgo a regular “Mazda” badge between the headlights (though just what badge that would’ve been is anyone’s guess given how many badges Mazda had back then) in lieu of the word “MAZDA” being written below the headlight on the passenger’s side of the car. Nissan got in on the action too. 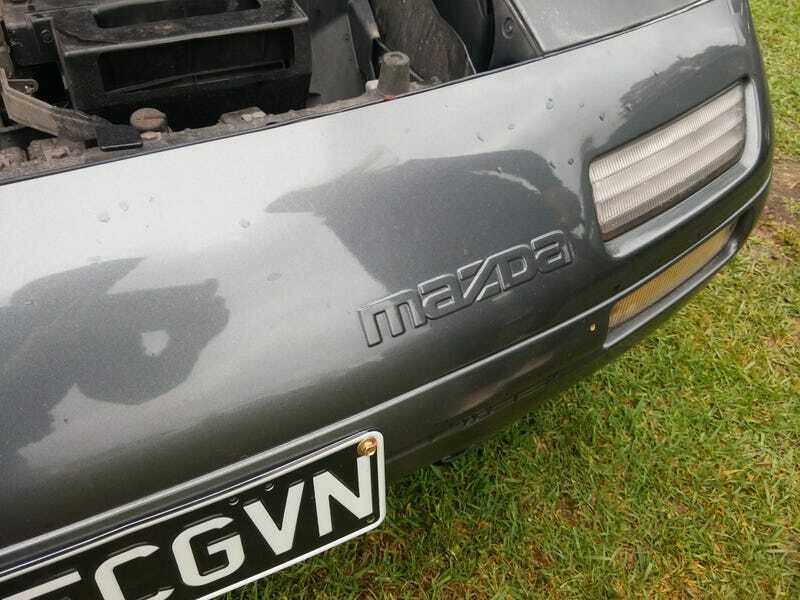 My old 1990 300ZX had a similar thing, the word “NISSAN” appearing in white writing on the grey “moustache” in the middle of the bumper, again on the passenger side (you can see it in the pic above, as well as the naked nose panel. Taken after I wrote off the car. And my heart). This was only a thing on the ’89/’90 300ZX, and possibly only in some parts of the world. I also once owned a (very broken) Nissan EXA, a car which came with “NISSAN” embossed on the front of the passenger’s pop-up headlight. So did Honda, with the DC1 Integra, which had a Honda badge in the middle but also had its name on the passenger side of the bumper. This is the most life we ever saw out of this EXA. It was very broken, went to the great scrap yard in the sky. I think this is an interesting trend. It doesn’t seem to have lasted very long (just one year on the 300ZX?! ), and I can only wonder as to what it meant. Maybe someone liked the clean look of a nose with no badges, though some cars kept their regular nose badge as well. There were some weird branding plays happening at the time, with Mazda trying to kickstart Eunos, Autozam and company, and Nissan doing the same with Infiniti. Curiously, most of the 300ZXs (again this varies per market) came with little or no Nissan badging across the whole car - Z logos on the wheels, steering wheel etc. Not sure if these are related, who knows. The Integra mentioned is a bit of a wild child having both manufacturer and model badge on the front, but research suggests there are few variations of this that have occurred. I’m sure I’ve seen something similar on a 1st-gen RX7 at some point, and I’m sure there are other cars throughout history who have done this in some form as well. All I know is a few cars do it, so keep an eye out.